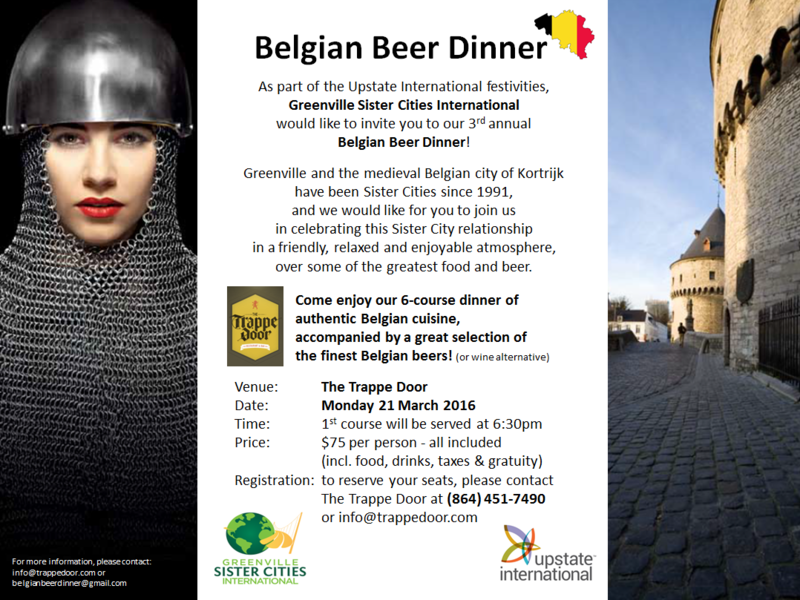 DON’T MISS TRAPPE DOOR BELGIAN BEER DINNER FEAST AS PART OF UPSTATE INTERNATIONAL 2016! 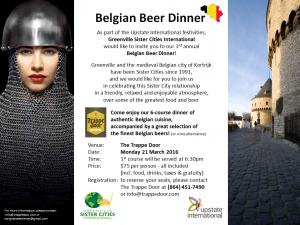 Greenville Sister Cities International is planning a trip to Kortrijk, Belgium, one of our “sister cities” in June 2016. Part of a “smart cities initiative”, the trip will investigate technology merging with modern industrial design techniques that allow today’s cities optimal functionality, and will also highlight entrepreneurship in high growth industries to sustain and grow business internationally for mutual economic and social benefits. 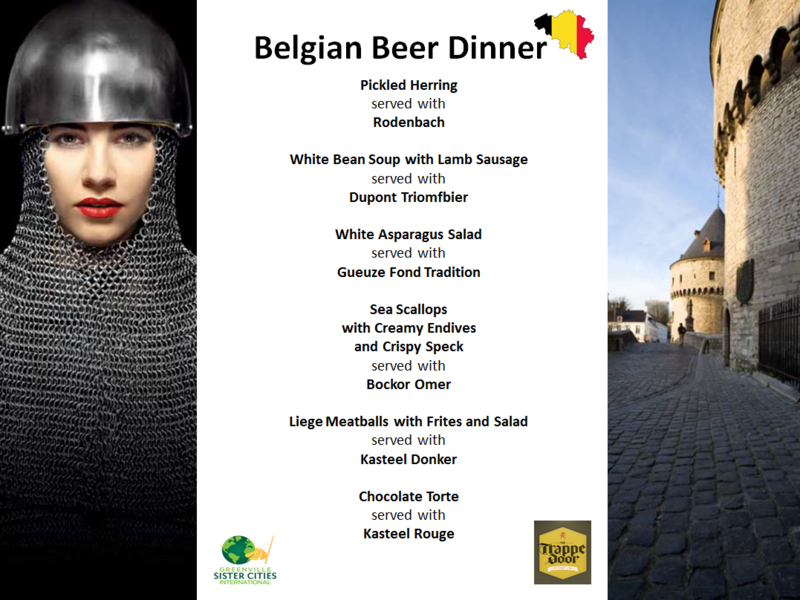 Interested businesses and/or individuals associated with Belgium are invited to take part in the Delegation trip. 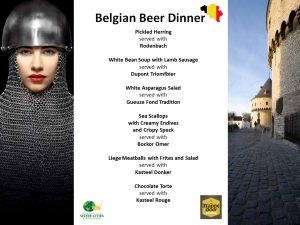 For more information about Greenville’s relationship with Kortrijk visit https://greenvillesistercities.org or to request more information about the trip, email stijn.vandevelde@gmail.com. Greenville Sister Cities International is known for their commitment to Youth Diplomacy. GSCI is currently accepting applications for one local high school student to become a Youth Diplomat. An application packet is available on our website or can be requested in an email addressed to Dianne Clarke-Kudless, dc-k@att.net. The deadline for completed applications is April 15 after which the GSCI selection committee will review application materials and meet with candidates. Candidates will be announced by May 15. The finalist will be presented to the City of Greenville and awarded a $500 scholarship that can be applied to attendance of the 2016 Sister Cities International convention in DC in July or the GSCI delegation visit to Kortrijk Belgium in June 2016. Finalists will also be invited to address the GSCI Annual meeting in January 2017 and to respond to requests to speak with local organizations on behalf of this program. GSCI Youth Diplomat term extends from June 1 2016- May 2017. What is a Youth Diplomat? understanding of Greenville and our connection to the world.